Easy access is one of the attractions of writing. And one of the examples of it is by providing the Table of Content. That’s why to provide ease in accessing this article, we provide the ToC below. With this Table of Content, you can simply get to the certain part of this Olympus VR-330 Manual writing simply by clicking on the points below. A manual can be used for multiple purposes. Firstly, it can be used as a reference for someone about the certain product. With this manual, someone like journalist, reviewers, and or editor, they can get a valuable reference for their writing. Second, this manual can be used as the guidance, especially for electronic product users. With this manual, users will be able to get some essential information about instruction, setting, and others. Look is one of the important aspects of an electronic product such as digital camera. From the look, people judge the inside of the product. And sometimes, look is also representing the character of user itself. That’s why look does matter. And based on this reason, we think that look of this camera deserves to be talked. So, before getting down to the Olympus VR-330 Manual, here we will talk about the look of this camera device first. Like what Olympus do on VR series, this Olympus VR-330 is also has good thin body with 1.1 inch body and 158g in weight. This compact size in Olympus VR-330 is good for the main purpose of this camera that is superzoom camera. So, the user may bring it easily. On the rear side, you will not see optical view finder. But, 3 inch LCD is aimed to replace the use of view finder. This screen is also used as playback screen. Setting buttons, as usual, are laced on the rear side with understandable layout. On the front side, Olympus VR-330 offers flash light beside of the lens. Talking about specification, the more detail specification of this camera can be found in Olympus VR-330 Manual. Here, you will not only find the specification. But, you will also find some information such as features, instruction, setting, and others. And to give you more understandable explanation, here is the brief information about Olympus VR-330 information. Olympus introduced new line of VR series named Olympus VR-330 in February 2011. This new series is the replacement of VR-320 which is previously launched. Olympus VR-330 is set as new weapon to compete in affordable camera with superb ability in zooming. Camera which is suitable for those who love to capture distant objects is priced about $180 which is affordable seeing the ability of superzoom on it. As what is stated before, Olympus VR-330 is designed well with focus on zooming ability with 14 MP sensor. 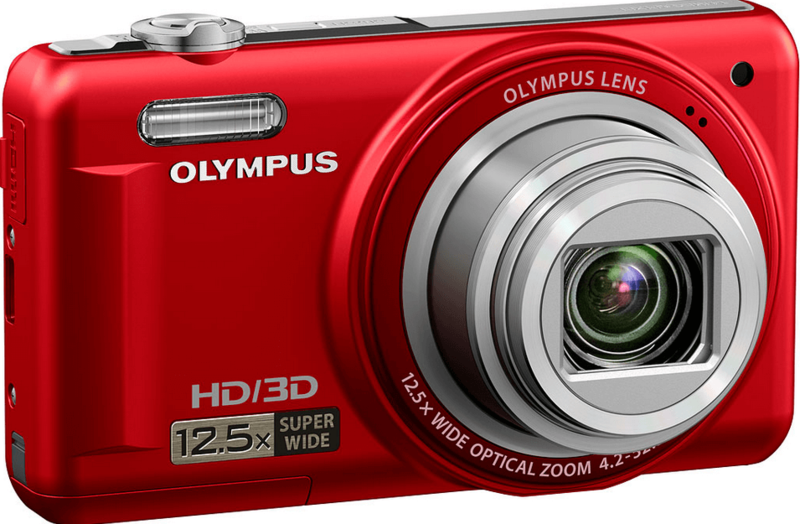 Moreover, Olympus VR-330 also has impressive quality 12.5x optical zoom lens. This lens is really functional by giving generous range of focal length from a 24mm, and wide angle to a 300mm telephoto.This cool camera has ISO rage from 80-1600 and aperture of f/3.0 wide and f/5.9 telephoto which guarantees you to get bright and vivid picture even in zooming mode. The other feature to love in Olympus VR-330 is improved image stabilizer. Here, true mechanical image stabilizer is used, which is better than Digital Stabilizer. This new feature ensures you to get good quality and blur free picture even with slow speed shutter speed and high ISO. To accommodate group portrait, this camera is also featured with face detection focus which gives you a good blur-free picture. This camera is also equipped with flexible rechargeable Li-ion battery. Seeing the price that is only 169 Euro for European market, it is not too much to say that Olympus VR-330 is recommended camera. Superzoom ability and super wide lens are the features should be considered most on Olympus VR-300. This camera is also equipped with Face Detection Focus and Full Mechanical Image stabilizer which give better performance in reducing shock to give clearer image. This is already stated in the first place that the aim of providing this article is to bring the Olympus VR-330 Manual on to the surface. With this manual, we hope we can help user in facing both major and minor issue related to this camera product. But, there is one thing that you need to remember before downloading the manual. It is that we will provide the manual in PDF file format. Therefore, before downloading it, it will be better if you install the PDF reader in your personal device first. Finally, that’s all of the information regarding to the Olympus VR-330 Manual that we need to share. Hopefully, it will be useful for you as it is useful for other users. Further, if you still have any other ideas about this product, we welcome you to put them in the comment session below. And if you think that this writing is informative, it will be much more appreciated to share it in your personal device. Therefore, the valuable information here will be networked wider than it is now.